Before a keeper can make a save, he’s got to be in a place where he can even attempt to make a save. That is the crux of basic positioning. A goalkeeper’s primary responsibility revolves around keeping a ball out of the goal. Take a good look at that goal, the one that is seven foot by twelve foot, 84 square feet. Throw in the fact that object to be stopped is a little more than seven inches in circumference and weighs about eight ounces and that the object in question can travel more than 100 miles an hour… a quick show of hands… who thinks this is going to be an easy position? Nobody ever said it was going to be easy, but good basic positioning can make goalkeeping an easier position. Logic and experience have taught me that if a keeper goes into the net without a plan, goals will happen with alarming frequency. Throw in a plan that allows the keeper to make a play on a shot from a place where he’s not having to desperately dive across the goal to make every save and that frequency starts to go down. In talking about a goalkeeper’s attributes, we talked about things like size, strength, speed and flexibility. These are the ingredients each keeper brings to his game and are unique to him. Successful goalkeeping means taking stock of your attributes and from those strengths, formulating a plan or philosophy as to how and from where you want to defend the goal and the circle. Solid, basic positioning should allow the keeper to make the most of his strengths. How he moves to get himself to those in-between positions. How a keeper stands in goal will depend on where the ball is on the field. Essentially we’re talking about what’s commonly referred to as a “ready” position. Ready is a fairly vague term. Ready for what? 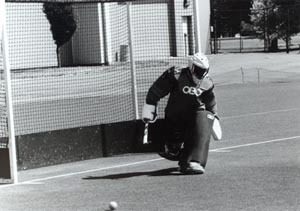 Goalkeeping requires several different types and level of readiness. 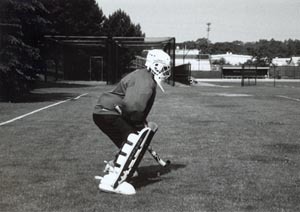 Typically the term is used to describe a keeper’s stance immediately before a shot comes at him. How ready and what he’s ready for will depend on the distance between the keeper and the shot and the amount of ground he has to cover before he can make a play on the ball. First off, playing the ball is critical. Playing the ball and being played by the ball are two entirely different things. When a keeper plays the ball, he is active and acting, he makes the save and is able to clear the ball. When the ball plays the keeper, he is acted upon, he is a passenger. Typically in these situations, he makes the save by either getting hit with the ball or desperately lunging to reach it. The clear is secondary, if at all, and the rebounds are dangerous. Sometimes a keeper has no choice but to make this type of save, but often keepers make this type of save because they weren’t “ready” when the shot is taken. There’s no one perfect ready position for every keeper. Every keeper is different and as such, has their own strengths. Having said that, there are common things that keepers are looking to do as they play a shot. They’re looking to make the save, first off. They’re looking to clear the ball to safety as quickly as possible. They’re looking to get into a position to play any rebound should they be unable to clear the ball. Save, clear, recover, when you start to think about a stance that allows you to do those things, you start to build the framework for a ready position. In evaluating the ready position of successful keepers, several common characteristics emerge. Starting from bottom to top, the first thing you notice is that the keeper’s weight is up on the balls of his feet, about shoulder-width apart. If you watch or play good tennis, the stance is very much like a player getting set to return serve. A keeper who wants to play the ball on a save, wants a good base to push off from with his feet. To do this he needs to be able to push off from his non-kicking/saving leg for low balls to the sides. If he can do this, he leads with his head when he extends to the side. Typically, when he pushes off to the side, he’s also coming slightly forward. He wants to play the ball in front of his shoulders from where he’s started in his ready position. When he does this, he cuts off angle at the same time as he extends out. We’ll talk much more about angles in a bit. There are some things you want to avoid in setting up with your feet. If a keeper’s weight is back on his heels, the keeper will usually lead with his foot out in front of the rest of his body. When a keeper gets his foot out in front of his head and body, the ball either pops up because of the angle of contact on his kicker or goes nowhere because he’s basically making the save with the bottom of his foot. Neither are good results. When a keeper gets too wide with his feet in his ready position, he also has a hard time pushing off explosively on his non-kicking leg. The result is he’s not able to fully extend with his kicking/saving leg and isn’t able to reach balls that are wide of his body. When his feet are too close together, a keeper can usually push off from his non-kicking leg, but will often get “stuck” picking his saving leg up to make a save. His weight becomes very forward, and he’s almost falling to the side when he makes the save. Because his weight is so forward, this falling causes his foot to get stuck and not fully extend. As you go up, the knees and the waist are the next significant areas in the ready position. The knees and waist are bent so that the keeper’s chest and head are over, or slightly forward, of his knees. When his head and shoulders are forward, he’s more able to lead with his head to make the save. If he can lead with his head, he gets more extension and can more effectively save/clear the shot (we’ll discuss this concept in much greater detail later). 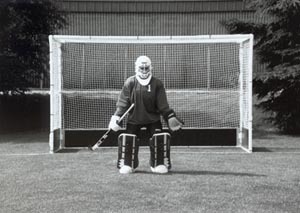 If a keeper is too upright at his knees and waist, he can still have his weight on the balls of his feet, but he’s unable to keep his weight forward and attack the ball when he goes to play it. A keeper who plays too deep in a crouch can also have problems. The keeper has too much bend at his knees and his waist, expends a lot of wasted energy just maintaining a ready position. Forget about being explosive to make the save, by the time the shot comes, the keeper who has too much bend either ends up falling forward as he goes to make a play on the ball or is dropping back on his heels from fatigue. Chest and arms are next as we move up and probably the area where there is the most variation in the ready position. The keeper wants to keep his chest above, or in front of his knees. This allows him to keep his weight forward. By also keeping his hands and arms in front of him, the keeper further reinforces keeping his weight forward while maintaining balance. Some coaches prefer keepers to play with their hands out to the side. This allows the keeper to take up more space, but the ready position isn’t completely about taking up space. 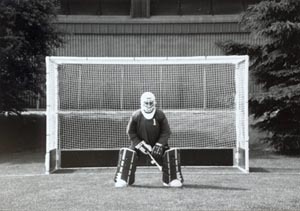 With his hands out to his side, as opposed to in front of him, the keeper has a harder time moving forward to the shot and maintaining balance. As a result, he might make the save, but often is off-balance if there is a rebound. The keeper who holds his hands out in front of him, also has an easier time opening his shoulders to his side when making a save/clear (once again, more about this later). A good example of the ready position from the side, weight is on the balls of the feet, with knees, chest and head forward. Examples of the ready position head on. Note that with hands in front (see previous tip on aerial balls) that the feet are a little wider. With hands out to the side, a keeper’s shoulders can get pinned back leaving him prone to having his weight back. What a good ready position can let you do. Actively playing the ball, the keeper has a good base to cross over and clear the ball using his right foot with power and accuracy. Having said all that, there is room for variation in the ready position. The bottom line is keepers should be judged by their effectiveness and not their appearance. Going back to the things we want a keeper to be able to do out of his ready position, save, clear, recover, if a keeper can do all this with an unorthodox stance, it may be best to leave him be. If those things aren’t happening, then it’s time to tinker. We’ve talked about how to stand when a ball is played towards him, part two is where to stand. This second part to basic positioning revolves around the concept of angles.